Over the last two decades, there has been an unprecedented development in the film industry, especially on matters relating to what was considered wrong or abnormal (lesbianism or the concept of being gay) during the 1950s and backward. Today, there are a number of films that have attempted to highlight or address the concept of lesbianism. Forbidden Love is an apt example of such a film. Forbidden Love is a classic Canadian documentary that revolves around the aspect of lesbianism or the idea that a woman can find solace, love, and comfort from another woman. This film significantly touches on the aspect of lesbianism featuring a woman (Laura) who decides to move away in search of her true self and how she ends up discovering her true sexual orientation in a manner that is reminiscent of some classic lesbian publications/novels and their subsequent clichés that appear to be a common motif throughout the film. Forbidden Love is an apt example of a film that can be closely likened to Carol in a significant way. In the same manner that Carol attempts to highlight how a woman can actually fall in love with another woman, Forbidden Love also makes the viewers see or try to understand the concept of lesbianism. Forbidden Love delves into some rich history of Canada’s queer women’s experiences during the mid 20th century when being gay was considered to be some sort of madness or abnormality. Compelling and often rebellious and hilarious in some way, the women that get to be interviewed in this film go ahead to recount their stories in search of places where they could be openly gay and truly express their feelings. 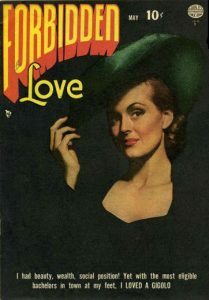 Of importance to note is that some contemporary interviews, a bit of archival footage, and some form of stylized fictional narrative that is based on a number of pulp novels during the 1950s are carefully woven throughout the simultaneous, heartbreaking, funny, and this film that ends up to be truly empowering. In an era where gay people were considered to be abnormal in Canada and other places across the globe, Forbidden Love tries its best to bring out or highlight some of the most important and empowering history concerning lesbian sexuality that is in Canada out of the closet. Forbidden Love features some of the unashamed tales of women who find solace, love, and comfort in the hands of other women in a period where women were not allowed to drink, frequent entertainment joins or truly express their feelings. Among other films that have attempted to truly highlight the concept of lesbianism or how two women can fall in love with each other and continue to live together as normal couples, Forbidden Love surely meets this goal. This movie does its best to address the concept of lesbian sexuality and how it is difficult to live in a society where sexual relationships are supposed to be between people of different sexes only. Forbidden Love makes us see and subsequently understand how tough it can be when one comes out or even attempts to declare that he or she is gay. Much worse, women seem to be the ones affected the most as depicted in this film. As the film progresses, we see a situation where women are compelled to resort or take part in “safe” dates with other homosexual men for purposes of hiding their sexual orientations for the fear of being discriminated against or being shunned by the larger public and their families based on their sexual orientations. Forbidden Love, just like Carol, is an interesting film to watch, especially for those people willing to understand the concept of being gay, especially among women. Still, this is a movie that attempts to highlight how it was difficult for women to openly declare that they were gay and had feelings for other women in an era when doing such was considered to be some sort of madness.